A solid “racked” position is something that seems to elude many an athlete, even veterans, yet is essential for effectively driving heavy loads overhead. I still see long time CrossFit’ers attempting a 1-RM Jerk with elbows behind the bar, shoulders retracted, bar resting on the collar bone instead of the meat of the shoulders, and the weight loaded up in the biceps. Such positioning does not lend itself well to optimizing transfer of force into the object and effectively driving a heavy load overhead. It is mechanically disadvantageous. The same is true if the elbows are too far forward and cranked up high like a Front-Squat. While an excellent racked position can be somewhat less critical for lighter weight fast metcons such as “Grace”, (though it would still greatly help), proper positioning for heavy singles is far more critical. Even if the athlete is just ridiculously strong, such as Dan Bailey, they will ultimately be able to drive substantially more weight overhead more effectively once they develop a superb racked position. An often overlooked yet key detail in effectively driving a heavy load overhead is having the shoulders protracted (forward) in the socket and somewhat elevated so as the weight of the bar rests on the meat of the shoulders. Not only does this position allow you to keep the center mass of the bar closer to your spine, and thus closer to your maximal line of force, but it also allows you to have body under the bar, which is essential to effectively transfer energy directly into the bar and launch it off of your body. With this position secured, so long as you stay tight in the surrounding musculature (chest, lats, delts, traps, etc) to maintain the position and tight throughout the entire midline, you will very effectively be able to transfer the power you are generating from the violent “jump” and vicious extension of hips and legs against the earth directly into the bar. Notice the positioning of the bar on Kendrick’s body. His shoulders are protracted in the socket (as opposed to either neutral or retracted), elevated and anchored firmly to maintain that position. Once in that position he keeps the entire surrounding musculature contracted firmly so as the weight of the load does not break the position and so he can efficiently transfer force once he commits to the Jerk. Note that his elbows are neither behind the bar, (as I still often see), nor way out in front like one has when doing a Front-Squat. His elbows are slightly in front of the bar and the shank of his forearm is aligned a little more vertically under the bar, allowing for far more efficient driving of the bar (and body in relation to the bar) once it leaves the body. Another thing to note is the width of Kendrick’s grip. Many of the top Weightlifters, regardless of weight class, country or gender, all widen their grip as they come out of the top of the squat after the catch before transitioning to the Jerk. This is true of athletes such as Kendrick J Farris, Pat Mendez, Ian Droze and Billy Bybe. This position not only allows for a bit more shoulder mobility in the overhead position during the catch on the Jerk for athletes who often Push-Jerk (Pat Mendez, Kendrick Farris) or athletes who Squat-Jerk (Pyrros Dimas of Greece) but, as our friend and Olympic Hopeful, Ian Droze, said, “the wider grip is less range of motion and more stable.” Less range of motion in that it is less separation one has to create between the center mass of the bar and the earth. While this obviously makes perfect sense, it is often overlooked by many athletes, even long-time experienced athletes. It is yet another detail that may allow you to PR your Jerk or Clean-&-Jerk. While there are many other factors that contribute to a successful 1-RM Jerk attempt, such as forcing maximum contribution from the hamstrings on the “Jump!”, keeping the torso upright, minimizing separation between body and bar on the “Dip”, and not falling victim to an overly elongated dip, to name a few, the “Getting Fat” position and the wider grip are two key elements that I often see overlooked by athletes, regardless of experience level. Kendrick J Farris represented the United States (and thus all of us) in the 2012 London Olympics. For those who don’t know, he is not foreign to CrossFit methodology. There are multiple CrossFit videos online with Kendrick Farris, one in which he is even learning the Kipping Pull-Up from Austin Malleolo with assistance from Steve Liberati. Kendrick has spent a lot of time with Steve Liberati of Steve’s Club in Camden New Jersey and with all the great kids of Steve’s Club. Kendrick J Farris is not only a great athlete and Olympic Weightlifter, but a great human being. 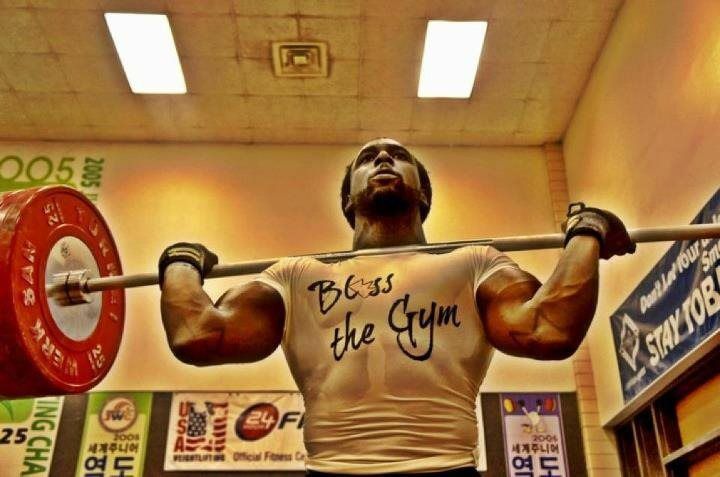 Olympic weightlifter Kendrick Farris demonstrating the "getting fat" position!